300 Whisper ammo was designed in the early 1990s under the guidance of J. D. Jones of SSK industries. According to SSK, "a Whisper cartridge must be capable of sub-sonic extreme accuracy with very heavy bullets for its caliber (240 grains in .30 caliber) as well as moderate to high velocity while maintaining excellent accuracy with light bullets for the caliber (125 grains at 2300 FPS in .30 caliber)." The 300 Whisper is based on the .223 Remington and .221 Fireball cases. But, unlike its progenitors, it uses a heavier .30 caliber bullet. It is sometimes called a .300 Fireball, a .300-221, or a .300 Warrior Carbine - mainly in efforts to sidestep the fact that the "Whisper" designation is a copyrighted trademark of SSK industries. In some of its variants, it meets the same specs as the 300 AAC Blackout. In fact, it is compatible with arms chambered for the 300 AAC Blackout (depending on which designer one speaks with, they are interchangeable). Its designer specifically states that it was developed to be used in a variety of weapon designs from AR/M platforms to bolt actions to single shots, and to be easily sound-suppressed; characteristics that make it of special interest to law enforcement and military consumers. The round is very efficient and excels when used as a subsonic round in sound-suppressed arms. Of course, it is available in both sub- and supersonic offerings from several major ammunition manufacturers. What is the Caliber of a .300 Whisper? The .300 Whisper has a caliber of exactly .308 inches. “Caliber” is a statement of the diameter of a bullet or the barrel’s interior, and it is generally used to quickly determine the size of a round. However, caliber is not the only factor when it comes to power, speed, and performance, as case length and design are also crucial. The name “Whisper” clues us to the design and purpose of this cartridge. The .300 Whisper is part of the Whisper family of cartridges, which were created by SSK Industries. This is a line of cartridges that were created specifically for military and police purposes, although they are used for specialty hunting. The line is marked by relatively large bullets backed by subsonic (slow) loads. Having a subsonic load allows the cartridge to avoid the sonic crack of breaking the sound barrier, and also makes them ideal for noise suppression. Along with the .300 Whisper, the line also includes the 7mm Whisper, the .357 Whisper, and the .500 Whisper, among others. What is the Difference Between the .300 Whisper and .300 BLK? These are two similar cartridges with a lot of overlapping dimensions, designs, and characteristics. However, these two cartridges are not exactly the same thing. Most expert recommend that you avoid interchanging these cartridges until you have the chance to talk with a qualified expert. There are differences in internal pressures, as well as slight differences in dimensions, so you don’t want to take chances with your rifle until you have consulted a professional. Your local gunsmith should be able to tell whether your gun can safely accept both. What .300 Whisper Cartridges Should I Select for Target Shooting? 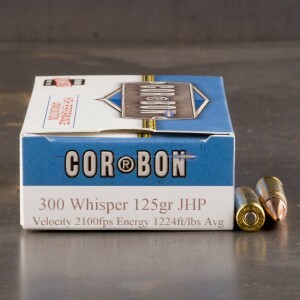 Although the cartridge may gain popularity in hunting as the years progress, the primary purpose for the .300 Whisper among the general population is target shooting and competition. 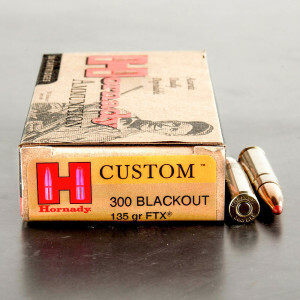 When choosing cartridges for these activities, you’ll want a full metal jacket round, which will deliver smooth feeding in a semiautomatic rifle. If you are shooting at greater distances, you may want to select a full metal jacket with a boat tail, which helps stabilize the bullet for greater long-distance accuracy and a straighter trajectory.